We hate to admit it, but the winter is quickly approaching. With winter comes dry air and, for many, dry or brittle hair. Dry, brittle hair results in breakage. It can be pretty hard to manage too. Sometimes your hair isn’t too dry, but is lacking protein. A lack of protein will result in hair that has some stretch, but still breaks more easily than healthy hair. An easy way to test your hair to see if it is dry or lacking protein is to wet a few strands. After you wet the strands, pull on one of them. If your hair breaks quickly, it is dry and needs more moisture. If your hair stretches a little but then breaks, it needs more protein. If your hair stretches a little and goes back to its original length, it is healthy. Aveda has a couple of products that can help those with dry or brittle hair. Aveda’s Botanical Therapy Damage Remedy Conditioning Treatment is the easiest way to add protein to your hair. The treatment will leave your hair looking healthier and shinier and feeling soft and silky. It is completed at XEX and lasts for 4-6 weeks. Contact us today to schedule an appointment. 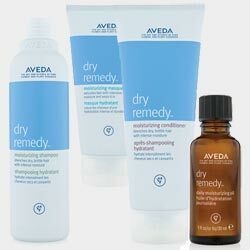 For dry hair, Aveda’s Dry Remedy line will help to add moisture to your hair. The new Dry Remedy Moisturizing Oil will help to keep your hair moisturized throughout the dry winter months. Botanical Therapy Damage Remedy Conditioning Treatment or Dry Remedy helps with dry hair.